This week, the government will run out of money on Friday, January 19. Once the clock strikes midnight, the government could be shut down, unless a deal over immigration is hashed out this week. Earlier this month, there was some hope. President Trump met with congressional leaders from both parties and allowed the cameras to capture the negotiation process for an extended period of time. There seemed to be consensus over border security and DACA recipients. How to move forward on the policy angle remained to be seen. Yes, there was an ulterior motive with that as well; Trump wanted to dispel that he was totally insane, which is something that’s being peddled by liberals lusting to toss him out of office. It did that, and then there was the “s**thole countries” remark. It sent liberal America into meltdown mode. They blew a gasket, some stroked out. 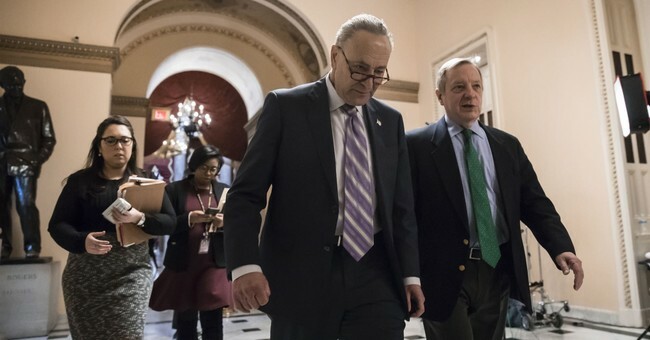 Democrats said they would not support another government funding measure unless a DACA deal is struck, a notable shift from Democrats in the past. In 2013, during the debt ceiling negotiations, Sen. Chuck Schumer (D-NY) called the legislative strategy of tying immigration reform to budgetary matters—and threatening to shut down the government in the process—as a path that would breed “governmental chaos.” On Sunday, California Attorney General Xavier Becerra appeared on Fox News Sunday with Chris Wallace, where he did his part trashing Republicans, but added that this DACA deal should there be one, ought to be a stand-alone piece of legislation. …that DACA deal should stand on its own, it should be clean. Worrying about the budget is what republicans and the majority in the House and the Senate should be doing because otherwise the government shuts down. Republicans are threatening to shut down the government unless they get a whole bunch of bad stuff on immigration and I believe Democrats are saying let's do a clean fix on DACA because it has nothing to do with the budget. If we could tie it all together, great, but don't try to hold young people hostage to get a budget and certainly don't try to load up a bill with that stuff whether in the budget or on immigration. Well, first, even The Washington Post editorial board, which does not agree with a wall, thinks it’s a fair trade-off; a border wall for DACA protections. Second, this is politics. If screwing over DACA recipients hurts Trump and energizes the liberal base, then of course Democrats would hold young people hostage. If it’s a tangible thing in time for the 2018 elections and they retake the House, then the whole negotiation process is flipped. They could get even better terms, but nearly one million DACA recipients will have to live in perpetual fear of deportation. Democrats already bet against the American worker, middle class, and economic growth with their universal opposition to this tax bill. Betting against people and hoping misdirected hostility is directed towards Republicans for their political gain seems to be the Left’s modus operandi as of late. It’s not about helping people; it’s about the narrative. And if a million people have to get screwed over for the long term goal of booting Trump in 2020 and crushing the GOP in 2018, then liberals wills hang out the Hispanics to dry. This is about the maximization of power. Hispanics are probably going to vote overwhelmingly Democratic, so yeah—liberals could roll the dice on this, hoping to retake Congress in the process. The base wants them to do everything to undercut Trump. Giving him funding for a wall would be the ultimate insult. JOHN DICKERSON, HOST: Some Democrats would like to use this to kind of push Republicans, make them answer for it, be -- particularly use it as way to gain more leverage over getting what they want for policy reasons. Obviously, also, they want to use it to politically hurt the president and his party. JOE MANCHIN: John, listen, that`s wrong, too. If only every member of the Senate Democratic caucus were like Manchin we could probably get a lot more done, or at least disagree in ways that don’t border on hysteria. Alas, we can’t always get what we want. If things don’t improve by mid-week and you did have plans to visit D.C. for vacation or a family trip, you might want to reconsider your plans.